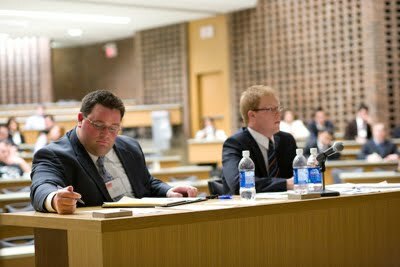 The University of Calgary took first and second prizes in the 2008 Osgoode Cup National Undergraduate Mooting Competition, which attracted 16 teams of university undergraduate students from across Canada to Osgoode Hall Law School of York University in Toronto during the weekend of February 23 and 24. University of Calgary team members Brent Kettles and Marek Broniewski won this year’s Osgoode Cup, and Whitney Skinner and Jack Maslen, also from the University of Calgary, finished second in what Osgoode Dean Patrick Monahan termed “the best final round ever.” Third-place went to two teams from the University of Toronto’s Pre-Law Student Clubs – Fariya Walji and Thaxsheni Sivarajah, and Valerie Stiso and Marcel Maltifano. Brent Kettles, left, and Marek Broniewski of the victorious University of Calgary team await their oral presentation. Top oralist awards were also given to Marek Broniewski (University of Calgary), Aaron Christoff (University of Toronto), Joseph Dixon (York University), Dhananjay Ghildyal (University of Ontario Institute of Technology), Brent Kettles (University of Calgary), Jeremy Larkins (York University), Jack Maslen (University of Calgary), Whitney Skinner (University of Calgary), Valerie Stiso (University of Toronto) and Fariya Walji (University of Toronto). Brent Kettles of the University of Calgary. 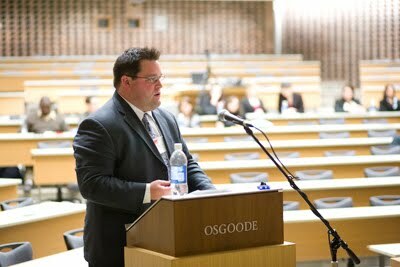 The Osgoode Cup National Undergraduate Mooting Competition, which has been held at the Law School every year since 2005, is designed to provide undergraduate students from across Canada who have an interest in mooting with an opportunity to develop their advocacy skills in an atmosphere of friendly competition, and to meet with professors and lawyers to receive feedback, advice and encouragement. Sponsored by Beard Winter LLP and the Law Foundation of Ontario, which provides travel bursaries for out-of-town competitors, the competition enlists the help of Osgoode students and alumni (who act as both coaches and judges) as well as volunteers from Humber College’s Bachelor of Applied Arts (Paralegal Studies) Program. Osgoode Cup entrants are given a case in advance so they can prepare their oral argument. This year’s case dealt with the issue of whether a limitation period precludes the plaintiff from starting a civil action against the defendant. Each two-member team argues both sides of the case during two preliminary rounds and the four highest-ranking two-member teams move on to the semi-final round. The final round is between the two winning teams from the semi-finals. 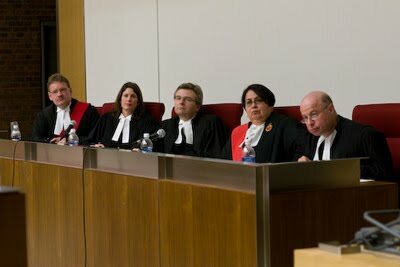 Judges in this year’s final round included two “real” judges – Madam Justice Rose Boyko of the Superior Court of Justice and Mr. Justice Peter Tetley of the Ontario Court of Justice as well as Osgoode Visiting Professor Janet Leiper, Osgoode Dean Patrick Monahan and John Olah of Beard Winter LLP. Preliminary round judges included Madam Justice Sally Marin of the Ontario Court of Justice, as well as numerous alumni lawyers of Osgoode Hall Law School. This year’s judges, left to right: Justice Peter Tetley of the Ontario Court of Justice, Osgoode Visiting Professor Janet Leiper, Osgoode Dean Patrick Monahan, Madam Justice Rose Boyko of the Superior Court of Justice, and John Olah of Beard Winter LLP, sponsor of the competition. Osgoode Cup participant Annamaria Perruccio, a law and culture student at York’s Glendon College, described the weekend competition as “a lot of fun and an excellent learning experience.” Dhananjay Ghildyal from the University of Ontario Institute of Technology called this year’s Osgoode Cup “a very successful event” and extended his congratulations to the organizers. 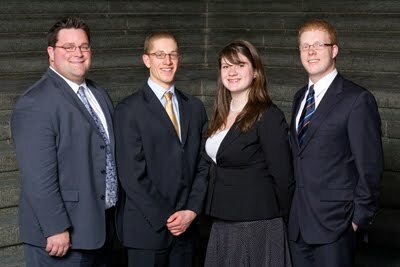 University of Calgary team members, left to right: Brent Kettles, Jack Maslen, Whitney Skinner and Marek Broniewski. Kettles and Broniewski (team 15 A) won the 2008 Osgoode Cup and Skinner and Maslen (team 15 B) were the second-place team.